IAM President Tom Buffenbarger called for strong support of North America’s business jet industry during his testimony before the International Trade Commission in Washington, DC. 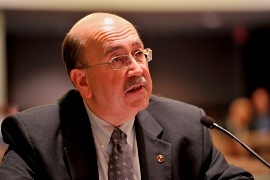 IAM International President Tom Buffenbarger called for an end to mischaracterizations of the U.S. business jet industry during testimony before the International Trade Commission in Washington, DC. America’s business jet industry contributes more than $150 billion to the U.S. economy and employs more than 1.2 million people. Buffenbarger also called for incentives and financing for commercial aerospace ventures that includes a requirement for recipients to manufacture, assemble and service business jets here in the U.S. Noting the aggressive and government-supported development of commercial aerospace industries in China and elsewhere, Buffenbarger urged the U.S. Trade Representative to investigate whether such countries are unfairly subsidizing the development of their aerospace industry.